Monday August 5 – A quick evening post for those of you who missed the live edition of Charlotte Today on WCNC channel 36 this morning. Here is a link to the video interview/segment with my friends and show hosts Colleen Odegaard and Ramona Holloway. Our topic: my five favorite new restaurants for August . My husband Tom Billotto was there, too, behind the scenes taking photos as fast as he could – hard to catch all the action, but Tom did a terrific job ! For details on each of the restaurants read the previous post here – Five Favorites for August and and enjoy! As always the show was great fun and time went by fast for this one; but the response has been overwhelming – so glad everyone like the concept – well do it again sometime in September – stay tuned and I’ll be sure to keep you posted on details. 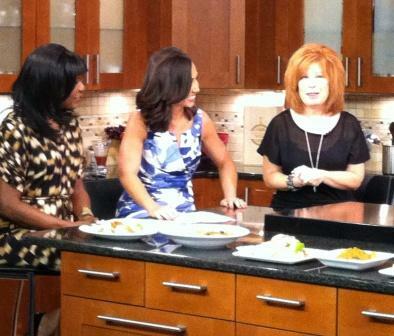 Meanwhile, as luck would have it , my friend Chef Jill Aker Ray was also on today’s show doing the cooking segment . Jill is private chef in Charlotte and always comes up with something fun. Here is the link to her spot on the show – a great recipe for a seasonal salsa used three ways – delish! After the show Tom and I joined Jill and another friend for lunch at American Café. Tom enjoyed the crispy batter dipped fish and chips with a heaping helping of hand cut fries while Jill and I decide to split two different sandwiches – the steak sandwich and Luca’s meatball sandwich, I have had the meatball sub before and was already a convert – but the steak sandwich – Oh my! 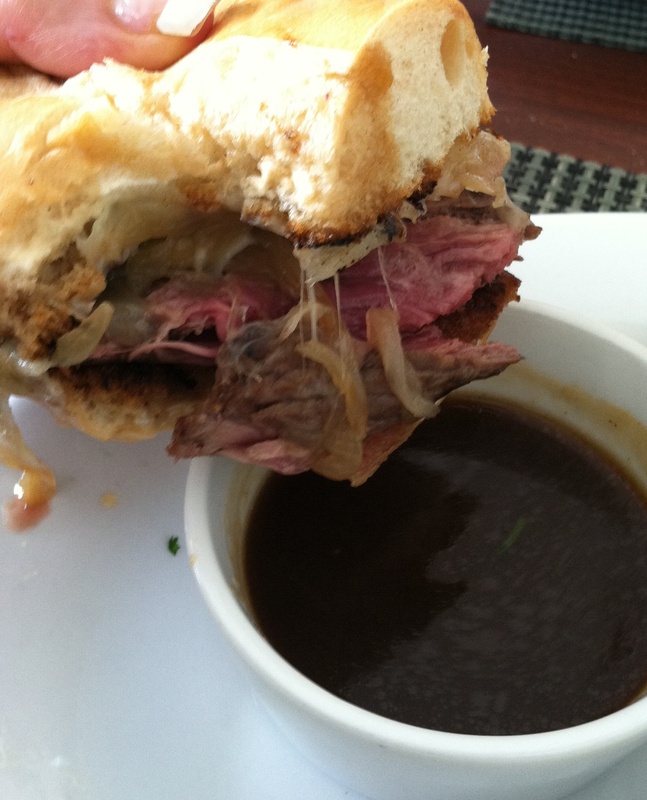 Off the hook, marinated then seared rare skirt steak thin sliced and snuggled into the soft bun alongside caramelized onion and a thin layer of cheese – au jus for dipping made it even better – put this one on your must try list for sure. Amazing thinngs here. I am very happy to see your post. Thank yyou a llot andd I’m looking ahead to touch you.